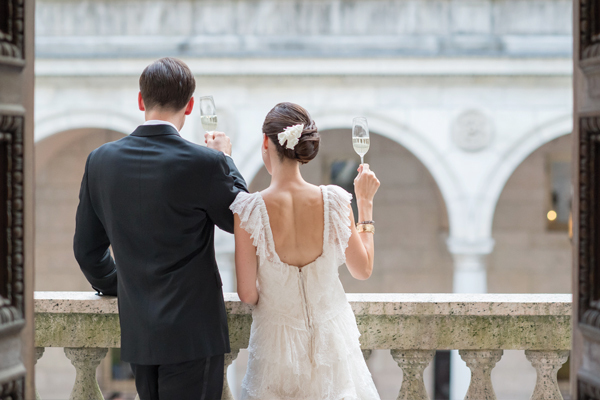 The perfect wedding toast is a work of oratory art. It can't be too short (cheers!) and it can't drone on and on. It has to be funny but it also has to be sentimental. So if you've been tasked with toasting the newlyweds, prepare to prep. The perfect wedding toast is a work of oratory art. It can't be too short (cheers!) and it can't drone on and on. It has to be funny but it also has to be sentimental. So if you've been tasked with toasting the newlyweds, prepare to prep -- and whatever you do, avoid these toasting faux pas! Don't be afraid to roast the bride or groom but know when enough is enough. There's a fine line between poking fun and being vulgar. So don't talk about how drunk they got at college and what trouble they used to get into. For starters it's unoriginal, but mainly because grandma and the in-laws are in the audience too. It doesn't matter how funny you and five other of your friends think something is, if half the audience doesn't know it, you're excluding them and they'll stop listening. More from The Knot:Marriage proposals gone wrong! Don't dwell on touchy subjects. Avoid talking about differences in religion, race and especially exes. These topics are totally irrelevant and it will make everyone feel super uncomfortable. Don't tell us how your friend is like your sister (Maids of Honor, this one's for you). We know you adore each other, that's why she gave you the job. Tell us why you love her, why she's so amazing and why she makes you laugh. Don't just use adjectives to describe the person you are talking about. You need to backup your descriptions with stories. The more specific you are, the better the speech. Don't be overly sentimental. Try for at least 70% humor and storytelling. When was the last time you left a wedding talking about an amazing speech that was all tears and 'I love yous'? If you think back over all the time you've spent together you'll find the juicy details about your friend and the humor. Don't speak for longer than five minutes. It's always better to leave the guests panting for more than wishing you'd stop. Don't get hammered at the open bar. If a glass of wine or a shot of tequila gives you a bit of confidence then go for it. But no more than one until you're done! Yes you've shared hundreds of adventures with your best friend or sibling, but you are best man or maid because all those stories make you an expert on them. Look through your speech and count the 'I's. Don't let nerves get the better of you! You're about to deliver the best gift to your friend you've ever given them - it's exciting and you should be looking forward to it. If you spend the whole speech freaking out, you'll regret it afterwards and you only get one chance so enjoy every moment of it. Special thanks to Victoria Wellman, co-founder of The Oratory Laboratory.